My name is Rachael Orben and I am a postdoctoral scholar affiliated with both the Seabird Oceanography Lab and the GEMM Lab here at Hatfield Marine Science Center. I am writing this from Anchorage, Alaska where Abram (a Master’s student at San Jose State University) and I are just finishing gear gathering and shopping before flying on to St George Island to spend the end of May and June observing, tracking, and sampling red-legged kittiwakes. This video is taken looking down to the beach from the top of High Bluffs, St George Island. Turn up the volume! Red-legged kittiwakes are endemic to the Bering Sea and most of their population nests on the cliffs on St George Island. 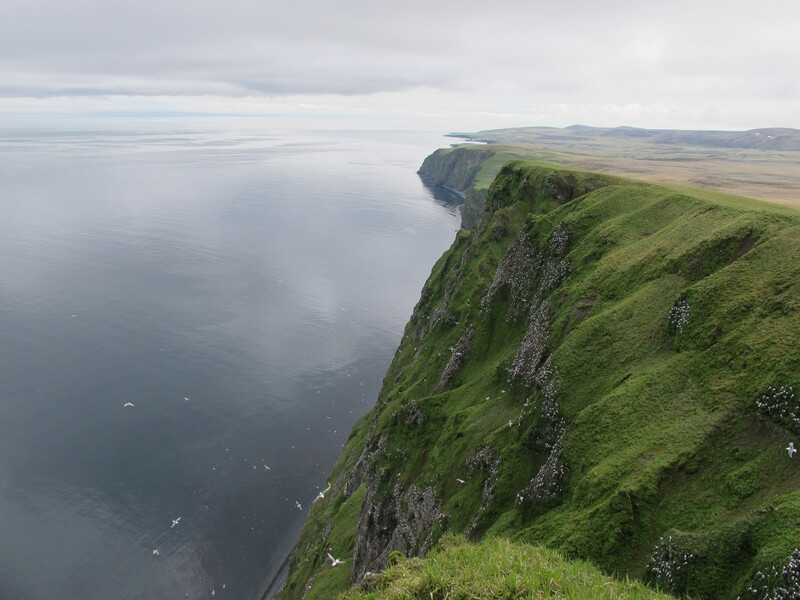 St George is one of the Pribilof Islands located in the southeastern Bering Sea and is home to over a million nesting seabirds including auklets, cormorants, kittiwakes, murres, and puffins. The Pribilofs are also known for the large rookeries of Northern Fur Seals (http://www.afsc.noaa.gov/nmml/education/pinnipeds/northfs.php). St. George has a small Aleut community (http://www.apiai.org/tribes/st-george/) so we will be living in town and commuting by ATV and foot to the bird cliffs. Click on the link below – Can you spot the red-legged kittiwake? We would like to know how individual foraging behaviour and physiology influence reproductive success and then how these might carry over to wintering behaviour. Tracking: We will be using GPS dataloggers (10g) and geolocation/wet-dry dataloggers (1g) to track movements and foraging behaviour of red-legged kittiwakes during incubation and overwinter. Physiology: When we catch birds we will take physiological samples to measure individual stress levels, mercury loads, and body condition that we can link to foraging behaviour. 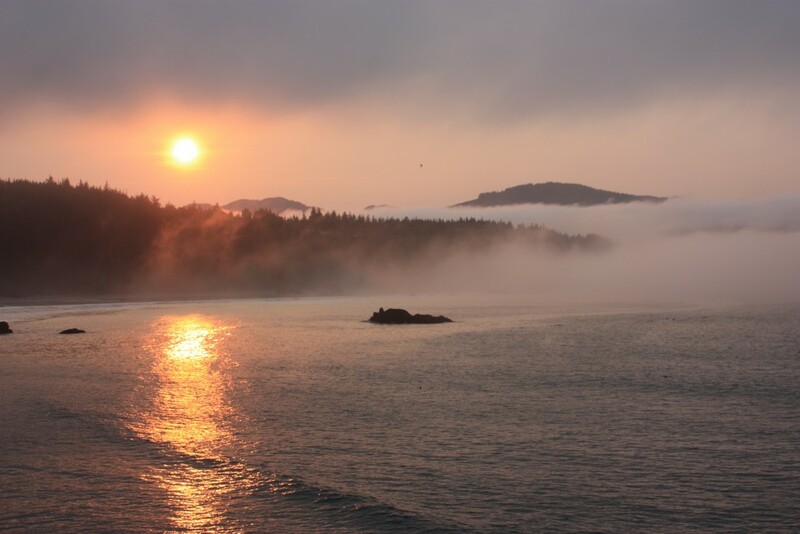 Observations: We will observe the birds that we track so that we know when eggs are laid, chicks hatch and fledge so that foraging and physiology can be connected to these measures of breeding success. And next year we will return and resight these birds to measure survival. Internet access will be intermittent on St George, but I hope to periodically post updates via Twitter @RachaelOrben (#OCGrants), Instagram @raorben, and the Seabird Youth Network Blog. My name is Florence, and I’m here to update you on all the amazing outreach activities that the GEMM lab has participated in this past month! 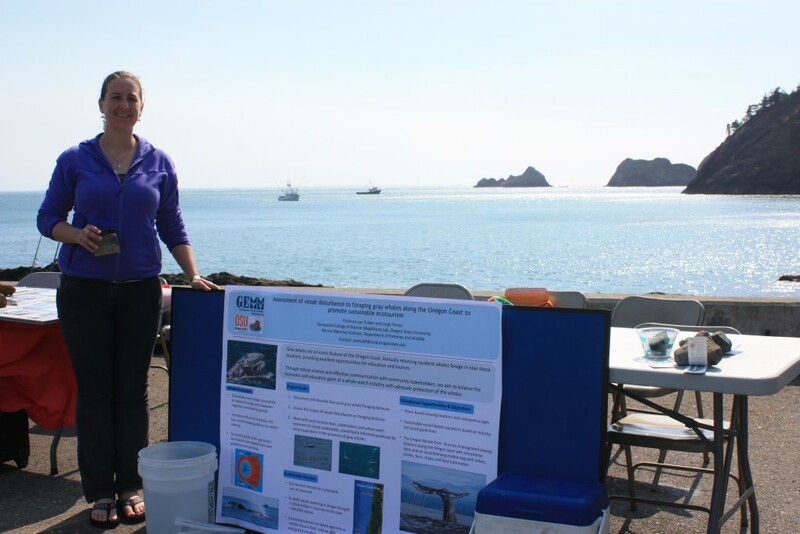 We started on April 11, with the HMSC-wide Marine Science Day celebrations. This year was particularly exciting because the Hatfield Marine Science Center is turning 50 years old! Along with the rest of our colleagues at the Marine Mammal Institute, we presented posters detailing our projects, had a few hands on activities such as ‘spot the whale’ – a bit of a scavenger hunt designed to give people a taste of how difficult it can be to spot marine mammals, and answered questions about our work. It was quite a success! The Redfish Rocks Community Team table! 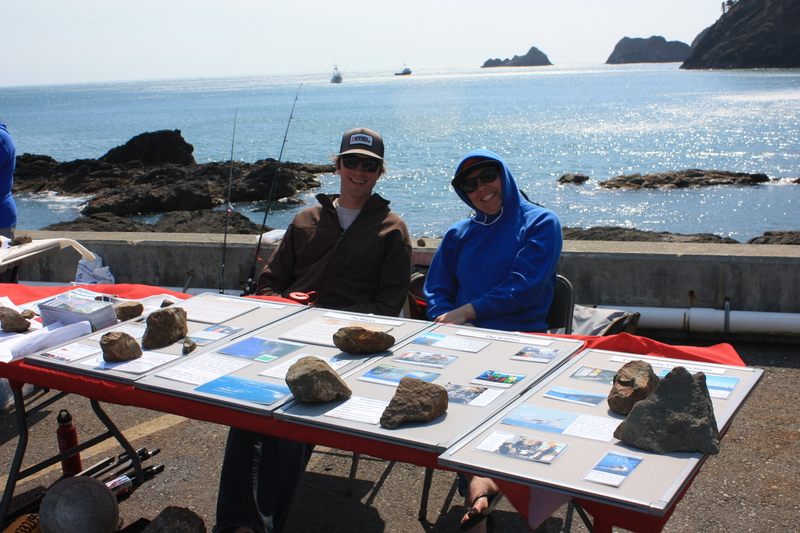 On April 19, I went down to Port Orford, OR to participate in “Redfish Rocks on the Docks” an outreach event showcasing all the exciting research being done in conjunction with the Redfish Rocks Marine Reserve near Port Orford. I presented a poster about my thesis project: Assessment of vessel disturbance to foraging gray whales on the Oregon Coast to promote sustainable ecotourism, and answered questions while leading folks through our ‘stay warm like a whale’ blubber glove activity. It was a beautiful sunny day, but so windy that at times we joked that our tables looked more like geology presentations than marine biology due to all the rocks holding everyone’s papers, photos, and flyers down! Many of the folks who I will be collaborating with over the course of this project also had their own informational booths; South Coast Tours, Redfish Rocks Community Team, and the Oregon Marine Reserves Program. The Surfrider Foundation and CoastWatch also had interesting activities and information to share about marine debris and conservation of our oceans. My favorite moment of the day was when I was explaining to a little girl how gray whales need to eat a lot of mysid shrimp in order to maintain their blubber to stay warm in the frigid ocean – and she intuitively made the jump from the blubber glove to the wetsuit she uses to go swimming! It was wonderful to see her thinking critically about the different strategies for heat retention in water. Solène received the Best Presentation Award! 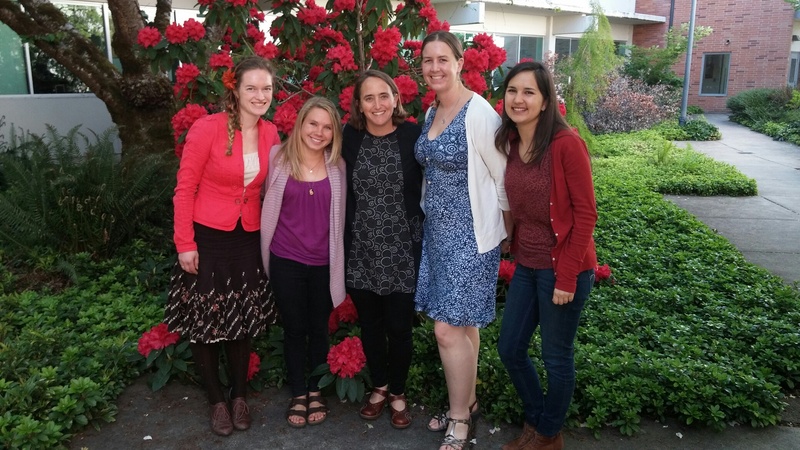 Finally, yesterday, almost the entire lab gave presentations at the Northwest Student Society of Marine Mammals Annual Meeting. The meeting was attended by ~80 interested students and researchers from a number of outstanding universities including; Western Washington University, University of Washington, Portland State, Stanford University and of course, Oregon State University. The day began with an excellent introductory presentation by Dr. Ari Friedlander of our sister BTBEL Lab, and then it was on to student presentations. Courtney and I presented in the ‘Human Dimensions’ forum on the possibilities of citizen science in marine mammal research and gray whale foraging ecology respectively. At lunch, our valiant leader, Leigh, took part in a discussion panel and fielded questions from the audience concerning current advances in technology and possible applications to field work as well as giving professional development advice. A few take away messages; Technology can provide wonderful insights, but one should not use a tool just to use a tool. Rather, it is important to first ask your question, and then build your methodology and choose your tools in a manner most precisely able to answer the questions at hand. In regards to professional development, do not discount the benefit of getting international experience – A broad perspective on possible solutions, and strong international collaborations will be necessary to solve many of the management issues facing our oceans today. During the ‘Bioacoustics’ session, Amanda presented her work concerning harbor porpoise spatial distribution. Finally, Solène presented her work on Maui’s dolphins during the ‘Space and Time’ Session, and walked out having earned the ‘Best Presentation’ Award!! 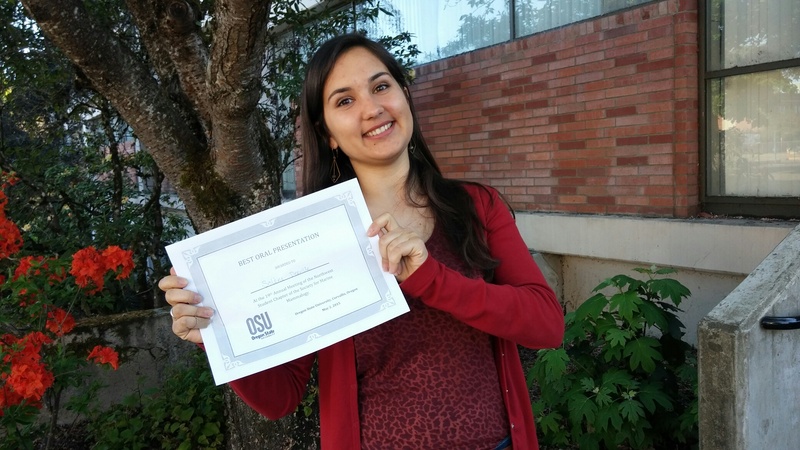 Over the past few months that she has been visiting us, she has been a dedicated colleague and a wonderfully cheerful presence in the lab, and it was fantastic to see all her hard work being recognized in this public forum. Overall, this NWSSMM conference was a great opportunity to see what other students in the Pacific Northwest region are working on, opened doors for future collaborations and gave us ideas for future projects.